Too many products wear out quickly, but their constituent materials last for millennia. This miss-match is responsible for part of our current environmental crisis. AlgiKicks use Just-in-time Degradability to match the product’s lifetime with the lifetime of its constituent materials. Using a Kelp based biomaterial developed with AlgiKnit, these shoes can be composted and their nutrients reclaimed through existing infrastructure and cycles. Kelp, is one of the fastest growing organisms on earth. When farmed in coastal waters, it recovers nutrients from run-off, generating raw material for the next cycle of products. 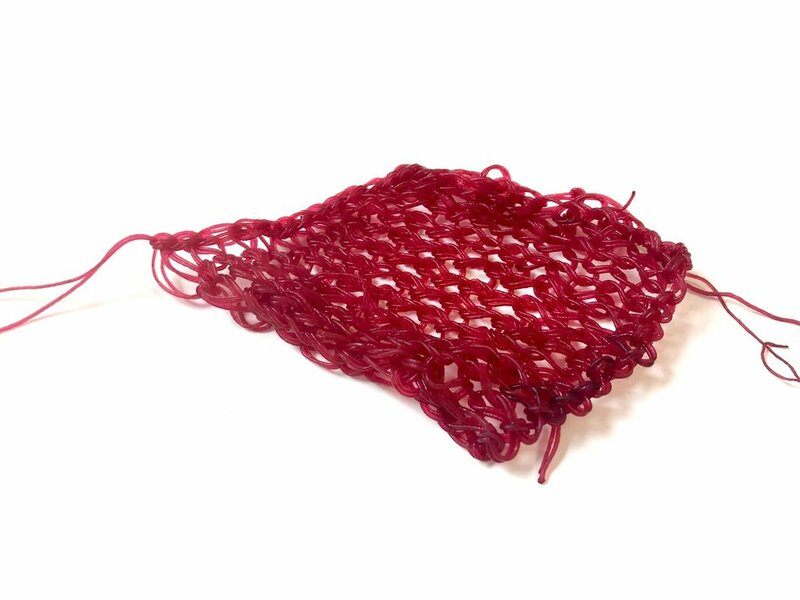 AlgiKnit's biopolymer gel is extruded and cured to produce a bioyarn that can be knit by hand or by machine. The yarn can be dyed using a range of dyes including bacteria-based biochromes.